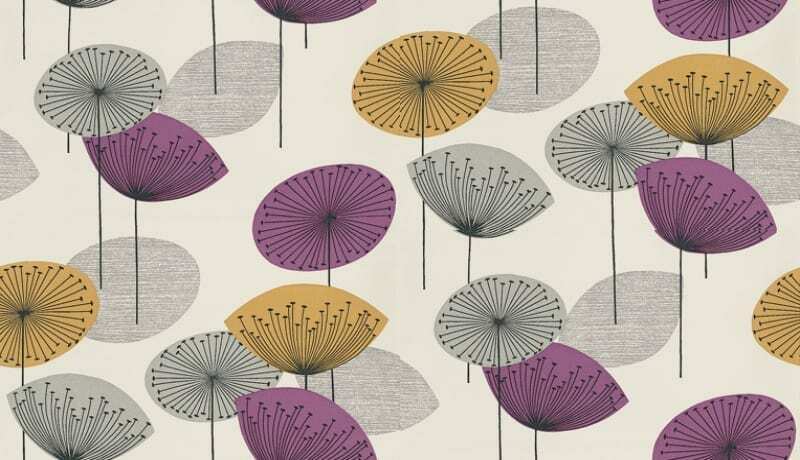 I am totally in love with this week’s Wallpaper, Sanderson’s Dandelion Clocks shown here in gold and mauve. It’s very 50’s and very retro, not usually a style I’m particularly drawn to but I do love the colour combinations. I’ve just treated us to some kitchen blinds in this Sanderson Dandelion Clocks print (a different colour combination and more about that later) and I think they look just great. The print is bold, the dandelion’s larger than you think and I find it rather serene and relaxing. This would look fabulous in a contemporary setting. White walls, grey accents, maybe a grey sofa, then pick out the purple and gold for splashes of colour. Still looking for inspiration for our dining room makeover, these colours are really taking my fancy. Available from my ever favourite wallpaper site, www.wallpaperdirect.co.uk this Sanderson paper sells for £35 per roll. Not extortionate at all particularly for your feature wall, or alcoves. What do you think? Anyone got this wallpaper? Or maybe other Sanderson Dandelion clocks interiors? Good to find another fan of this wallpaper! I love it in this colourway, as well as the blue/green. It’s definitely one of the more affordable wallpapers and works so well as a feature wall.